It’s been a day. Putting yourself out there on social media is more time- and soul-consuming than I’d ever imagined. And because I continue to do this anonymously, I’m running up against some cross-platform integration issues. Anyone wise and can help me around them? It’s nothing I can’t just copy & paste between networks, of course. But I’m trying to learn everything at once on less than 100% brain capacity. The morning began peacefully. I enjoyed a long chat with S at the cafe. I told the cafe’s resident published novelist M that I hope one day I can have a real, live writing date with her there. She’s been camped with her laptop there as long as I can remember. As I spoke with S, a woman approached me with a note. She’d seen me in the neighborhood, and also at the cancer center. She was making an approach. I was so amazed and so grateful. All this time, I think I’ve been avoiding making meaningful connections with other patients, as though I could exist on this weird immunotherapy island until I am rescued. All I do on the island is blog, though. The past couple weeks I have been relishing the most wonderful human connections, meeting friends, talking with them, and (thanks to being on half the steroid dose I was last week) actually listening to them talk, too. I’ve learned a lot about my friends. I’ve learned how much I appreciate them, too. Last night I was mentioning something about my medicine to the kids. I can’t remember why, I didn’t just bring it up randomly. But I did use a phrase I hadn’t used before. I said the medicine was “saving my life.” Young J looked a little strange. I may have repeated the phrase. And then it dawned on me that I have at no point told my children that I have a disease I can die from. That has never seemed like a productive thing to say, and I’m benefiting from a treatment that has so far shown such success, it just didn’t occur to me to tell them. It’s bad enough I’m inflicting on them a level of anxiety and stress I never, ever endured in my own childhood – why clue them in that people die from cancer? I don’t know if he dwelled on it long, but – you guessed it – I did. I decided that I was every bit as bad as Roberto Benigni in the wretched Shoah movie he made, Life Is Beautiful. I remember going to see that movie with my cousin when it came out. I was full of anticipation. I loved Benigni’s work before that point. But the movie sickened me. My family connections to the Shoah are too close to be able to take a movie like that at face value. My cousin and I left the theater and it became very apparent immediately that we had each seen a different movie. She was charmed by it. When she learned I was not, she turned on her heel and walked away. I walked the other way down Houston St.
It’s a little heavy, implicating myself in perpetrating fraud to get my kids through this tough time. But at the end of the day, a day spent tugging social media every which way to see how it might work for me, a day spent not eating enough and certainly not taking the nap that would have easily come if I’d only let it, that’s where I am. I got a package from a dear friend across the country this afternoon. 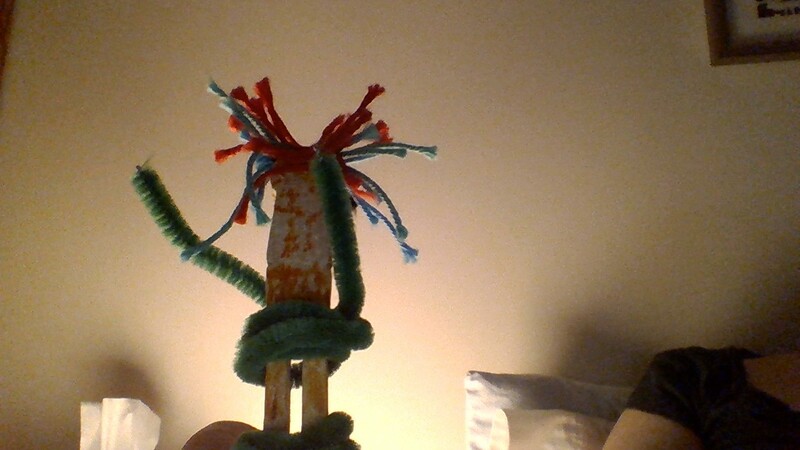 Her son (who is the same age as Young A) made me the most beautiful worry doll, with red hair like mine, even. I’ll share it with you, because I can’t show the kids, so they won’t worry. Thank you, dear, sweet S and Young S, all the way across the country.